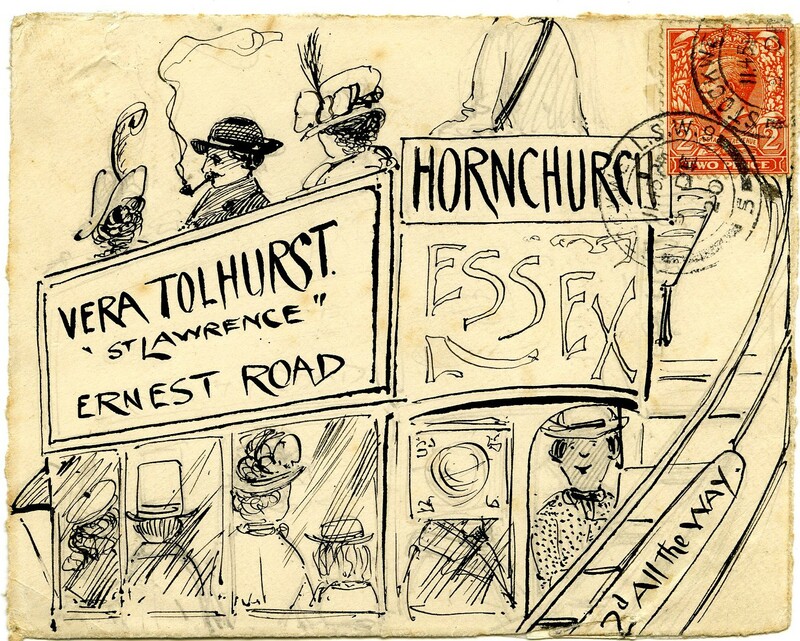 We love a mystery at the British Postal Museum & Archive and the identity of the artist behind the illustrated ‘Tolhurst’ envelopes has intrigued us for years. 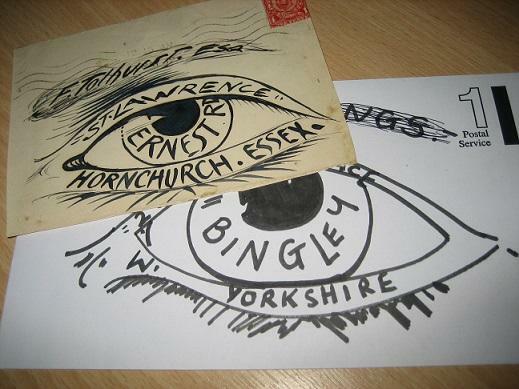 The first step in identifying the artist was to research the address to which the majority of the envelopes were sent: St Lawrence, Ernest Road, Hornchurch. Staff at Havering Museum, where a selection of the envelopes were recently displayed, found that the 1911 census showed the occupants as George, Amelia, Frederick and Amy Tolhurst. Frederick and George Tolhurst, father and son, were frequent recipients of the illustrated envelopes. Locating the census record enabled the identification of all but one recipient: Vera. 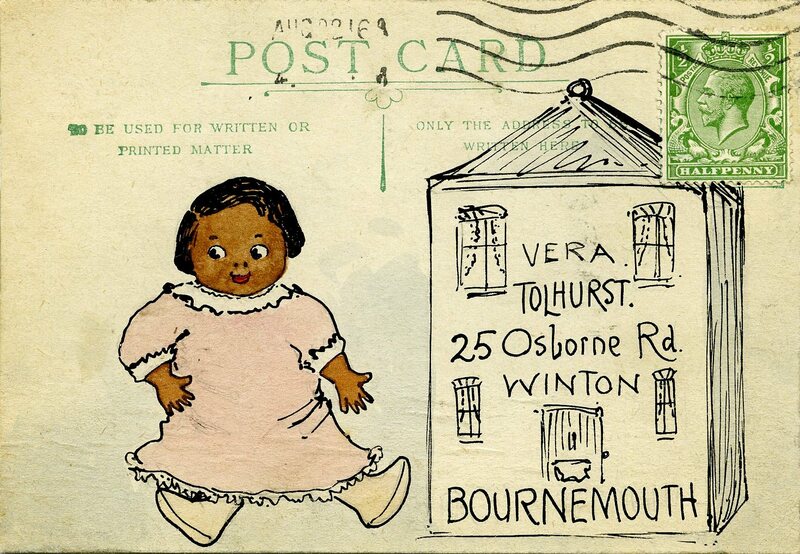 Vera received the majority of the illustrated envelopes in the collection, and the majority of Vera’s letters were sent to the Hornchurch address. 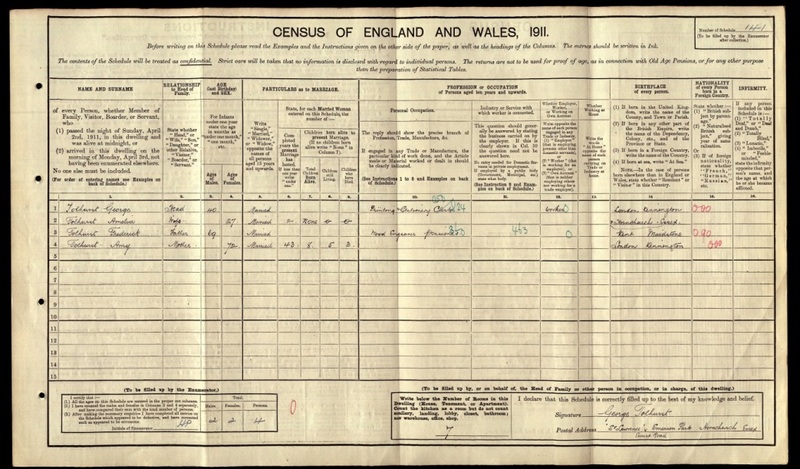 However, she did not appear in the census record, nor could we find her in the birth records of the General Register Office, due to lack of information. Not put off, we used the information we had accumulated to construct a family tree. 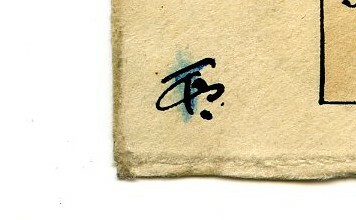 Returning to the envelopes, we found a vital piece of information: the initials ‘FC’ or ‘FCT’ appeared in the corner of several illustrations. Using the family tree, we narrowed down the identity of the artist to Frederick Charles Tolhurst. The identity of Vera continued to elude us, however. We considered whether Vera was a nickname, or perhaps an acronym, but we had no evidence to confirm either of these theories. We drew a step closer to the truth last week when we discovered a postcard which was addressed to Vera and signed ‘with love & kisses from your Mama & Papa’. We searched the birth index for Vera Tolhurst and identified a Vera Sylvia Tolhurst, born in 1908 in the district of Lambeth. A copy of the birth certificate arrived at the BPMA yesterday: listed as Vera’s father is Frederick Charles Tolhurst, and listed as his occupation is Lithographic Artist Journeyman. By 1911, Tolhurst’s occupation had changed to Trade Union Secretary, but his artistic talent was maintained in the mail art he frequently sent to his family. I’ve been inspired by the Tolhurst envelopes to try my hand at mail art. Why don’t you have a go and let us know if they arrive by Tweeting @postalheritage using #mailart. 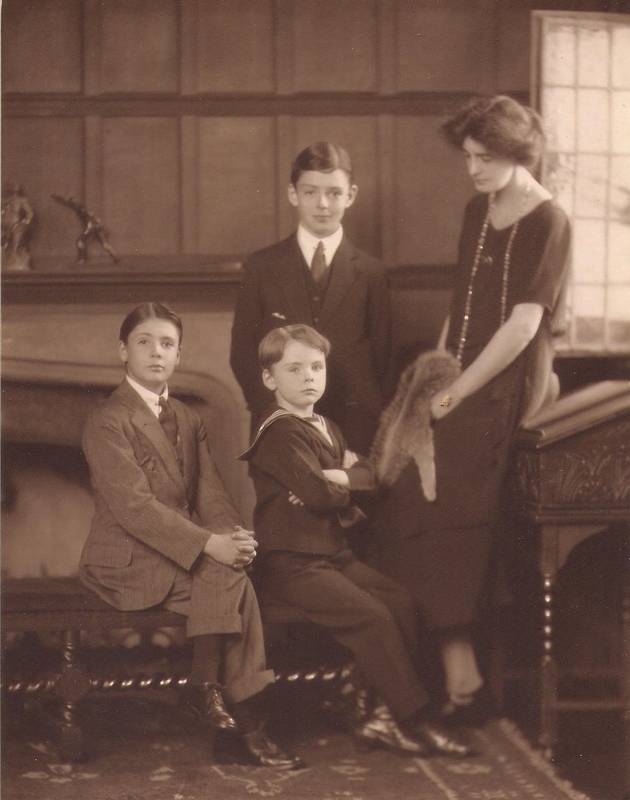 This Thursday we welcome Aaron Manning from the Warwick Castle History Team as he gives his evening talk ‘To Warwick with Love’ – The Private Postcards of an Aristocratic Family, 1914-1917. Upon arrival enjoy a complimentary glass of wine and experience the nostalgic music of the First World War era. Then, sit back and allow Aaron to reveal, for the first time, a century-old hidden story from the castle. 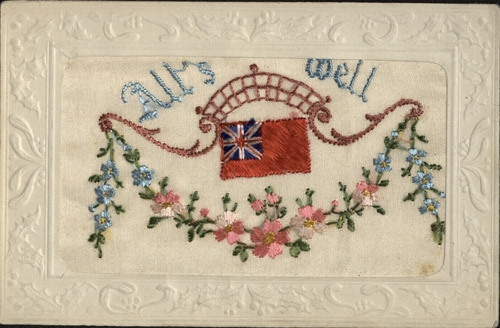 First World War era postcard. 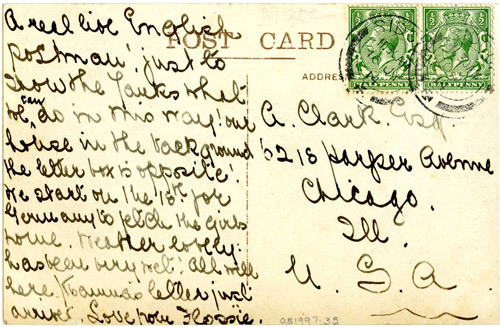 For nearly a hundred years a box of postcards lay hidden and untouched in the living quarters of the castle. A box of postcards that would tell the tragic story of how war tore apart the family of the Earl of Warwick. These intimate messages, sent between mother, father and children during the First World War, will be shared by Aaron in this fascinating, poignant talk. Finish off your evening by further immersing yourself into the story through investigating first hand a selection of these copied postcards, with our speaker Aaron on hand to answer any of your questions. 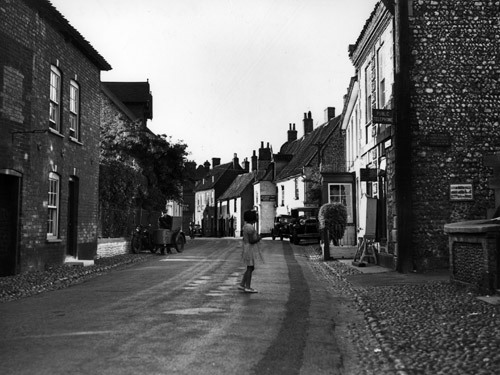 The BPMA is the custodian of a photographic collection which includes about 100,000 individual photographs; the earliest is from the late 19th century and the latest ones date from the 1990s. In a previous blog on our photography collection and a talk now available as a podcast we have presented some of this fascinating material and the stories behind it, and our exhibition The Post Office in Pictures features some of the most striking images. The GPO Britain postcard set. The photographs depict life in Britain at the time of the General Post Office (GPO) with its contrasts between modern urban areas and the industrial heartland, and the remote rural regions where the postman or postwoman presented a vital connection to the outside world. We have selected six of the most intriguing images for a new postcard set which is now available from the BPMA Shop. 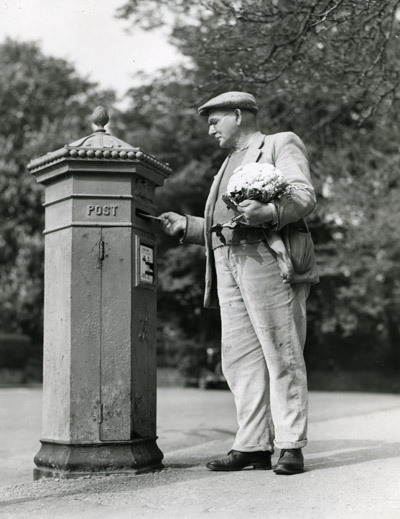 Many of these photographs have been published in the Post Office Magazine (POST 92), which was first issued in 1934 in order to promote postal services and good relations with the public, aimed at the large postal workforce, their families and friends. 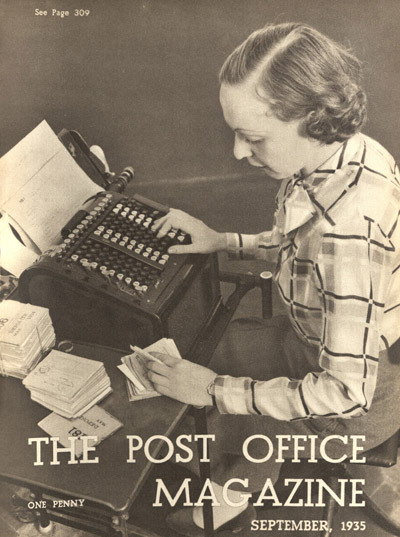 The articles often presented the modernity and efficiency of the GPO’s services, such as the Post Office Savings Bank – “Everybody’s Bank” with ten million accounts, according to the author of an article in the September 1935 issue. The story on the bank, which holds “the small savings of ordinary not-very-wealthy folk in the hamlets and towns and cities of Britain”, is accompanied by several images of banking clerks entering the 120,000 daily transactions in the newly adopted accounting machines. The clerks’ efficiency in dealing with the amount of correspondence and day to day business clearly impressed the author – he dubs them ‘super clerks’. Other sections of the magazines were regularly dedicated to news from the different UK regions. 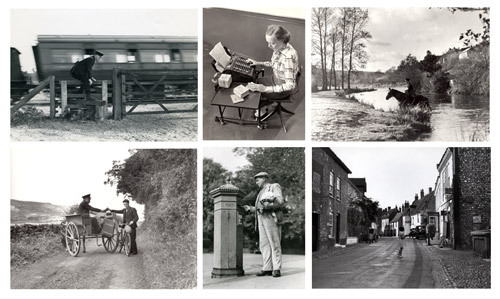 These focussed on the local postal staff and their achievements, activities and work in their local community, which, to today’s readers, provides some authentic insights into rural British communities in the 1930s and 1940s. 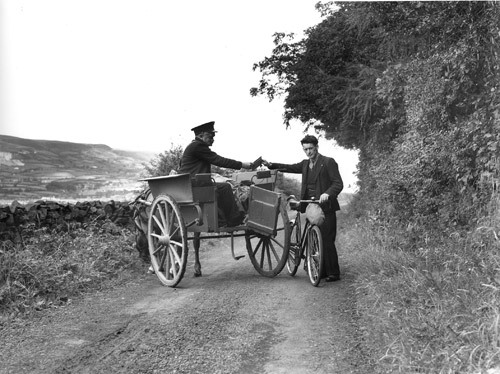 The October 1938 Northern Ireland section, for example, features the image of a postman with a pony and trap on a rural road: “The Glenarm Bay postman goes on his delivery in a trap presented to him by local residents” (POST 118/903). 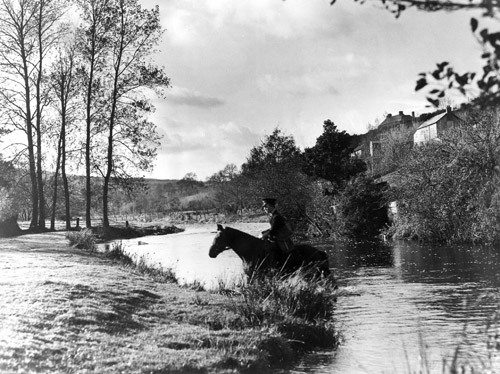 Other issues show postmen wading through rivers on horseback (January 1939) to reach the next village or town, or recount the peculiar history of whale bones decorating the post office exterior at Cley-next-the-Sea (March 1938). The GPO Britain postcard set is now available from the BPMA Shop for £3.75. Subscribe to the BPMA e-newsletter now and receive exclusive reader offers with free postage or special discounts for this and other new products regularly to your inbox. In April we invited the writer, broadcaster, artist and musician David Bramwell to the BPMA to give a talk on the history of postal mischief. This turned out to be a fascinating and highly entertaining event, looking at the work of key players in this field including the ‘King of Mail Art’ Ray Johnson, Victorian prankster Reginald Bray and musician Genesis P.Orridge, who inadvertently changed the postal laws (owing to the ‘colourful’ nature of his homemade postcards). Colourful mail art referenced in David Bramwell’s talk. David also shared his own exploits in mail art, which saw him and a friend post unusual objects to each other – much to the amusement of local Post Office and Royal Mail staff. 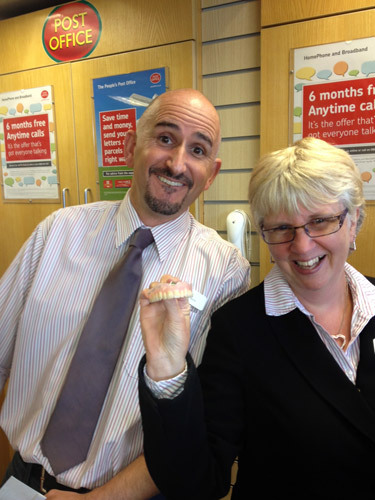 Post Office staff were amused when this set of false teeth came in to be posted! You can now listen to or download David Bramwell’s talk as a podcast via our website, iTunes or SoundCloud. 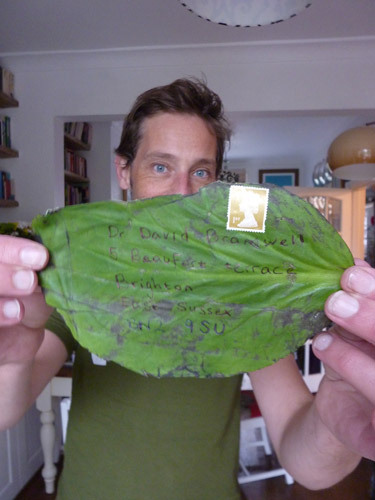 And if David has inspired you to engage in some postal mischief do let us know about it! A tropical leaf which was posted to David Bramwell. Find out about our upcoming talks and other public events on the Events page of our website. In December 2011, as some of you may remember, BPMA and the BBC produced a collaborative radio series entitled the People’s Post. One episode of that series focussed on the culture of letter writing. Ever since this episode I have been intrigued by this subject and the many different forms letters have taken, particularly in the 19th and early 20th Century. As a result I decided to delve into the BPMA collection to see whether a culture of letter writing was reflected in the objects and files in the collection. On Thursday 20th June at 7pm I’ll be giving a talk in which I use objects from our collection as a basis to explore how postal reform helped the development of this culture of letter writing and sharing some of the weird and wonderful things I’ve discovered. Some of the broader themes I’ll be looking at are the introduction of the penny post, the development of envelopes and postcards, as well as the sending of cards for special occasions such as Christmas. I am by no means a postal historian and this is much more an introduction to some of the main changes in the 19th Century postal system and how these are reflected in the objects I’ve found within the BPMA’s collection and the social history they tell. 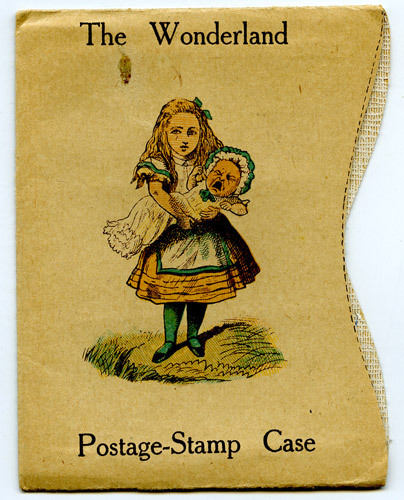 These objects range from various Curious Addresses – the name given to envelopes where the address is presented in a different format such as a poem or a picture; Lewis Carroll’s Wonderland Postage Stamp Case; the Express Delivery form used by suffragettes to post themselves as ‘human letters‘ and an account of a kitten being sent through the post as well as numerous postcards and letters. 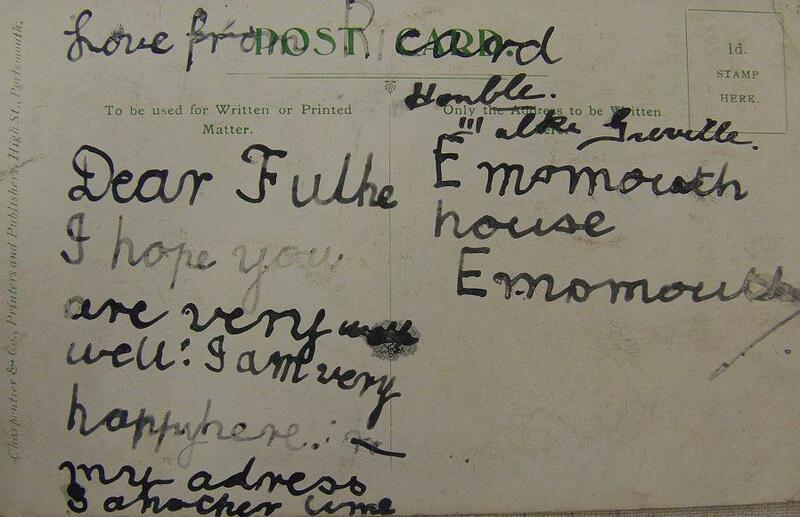 See images from the Curious Culture of Letter Writing on Flickr. On Saturday 6th April I ventured to Loughton, Essex to visit The British Postal Museum Store for the Pillar Box Perfection open day. Currently studying photography at the University of Bedfordshire, I’m now in my final year working on my final major project. The visit was in aid of my university project ‘POST’ a project which looks at pillar boxes and how my generation rarely write any more. “Pillar box alley” at The British Postal Museum Store. We live in an age now where we are constantly tuned into our digital social lives by texting, instant messaging and emailing. In my generation the everyday analogue process of posting a letter is quickly becoming a thing of the past. Postboxes lie dormant, statues and monuments of a bygone era. Fond of analogue tradition I decided I wanted to get myself and as many people involved as possible mailing postcards in the form of photographs. Postcard showing a Queen Elizabeth II wall box. 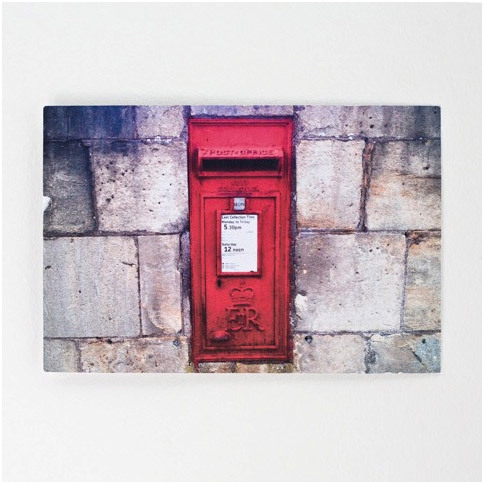 By getting people to photograph postboxes I hope to create a large topology to showcase the results, which will I hopefully display in a gallery space. For the time being I’ve set up a blog site where I’ve regularly up load all the entries sent to me. Which you can visit here: www.thegreatpostproject.wordpress.com. As I love a challenge, I am hoping that my project will make people take notice of postboxes again and in the grander scheme get younger people involved in writing letters and postcards. Although it may be wishful thinking, only time will tell. 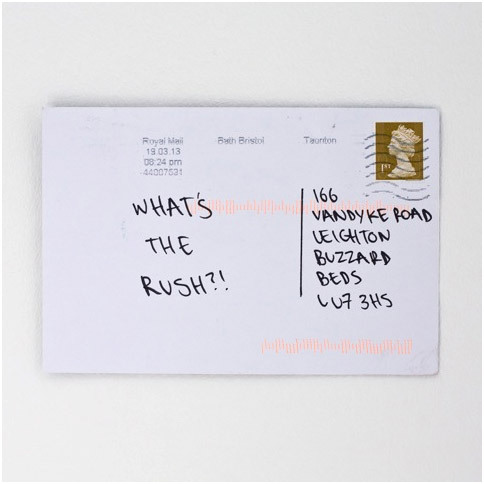 Postcard showing the message “What’s the Rush!!”. 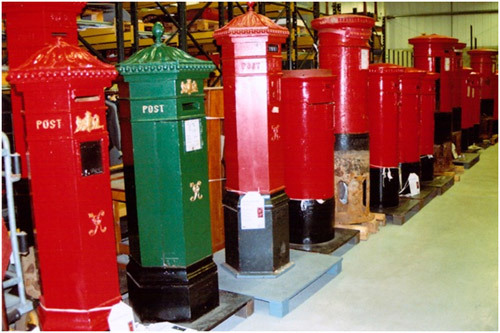 The open day at The British Postal Museum Store was a great way to learn more about the history of the pillar box. Discovering the different types whilst being able to identify them I found it to be a rewarding experience. It really has helped me, by giving me a historical outlook which I can now apply to the project. The staff were tremendously helpful giving talks throughout the day, and answering all my questions. A big thank you to those who work and are involved in The British Postal Museum & Archive you generosity hasn’t been unnoticed. If you are reading this and feel intrigued by my project feel free to visit the POST blog site and get involved, and last but not least please do visit the The British Postal Museum Store when you can, it is worth it! On Thursday 18th April we will be welcoming writer and performer David Bramwell as he presents a talk exploring the curious history of postal mischief. Using a slide show of fascinating images and video clips David will discuss the key mischief makers, including the ‘King of Mail Art’ Ray Johnson and Victorian prankster Reginald Bray. 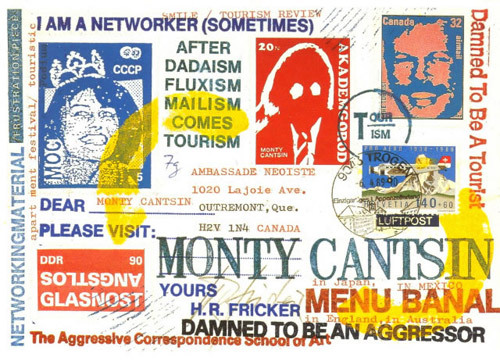 In addition, the musician Genesis P. Orridge who inadvertently changed the postal laws thanks to the ‘colourful’ nature of his homemade postcards! 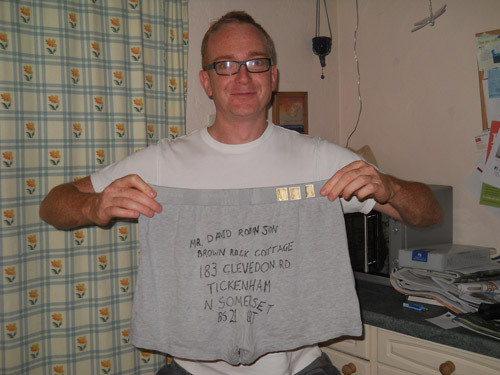 David Bramwell tries to post some underpants. When you leave, indulge in your own postal mischief too – David will be hoping to inspire you to ‘post a flip-flop to someone you love’ by sharing his own exploits in mail art. David has won a Sony Award for his work on Radio 3 and spoken at TED, Idler Academy and Alain de Botton’s School of Life. He runs the Catalyst Club in Brighton where everyday people talk about their passions in front of a live audience. Visit our website to book for Postal Mischief.